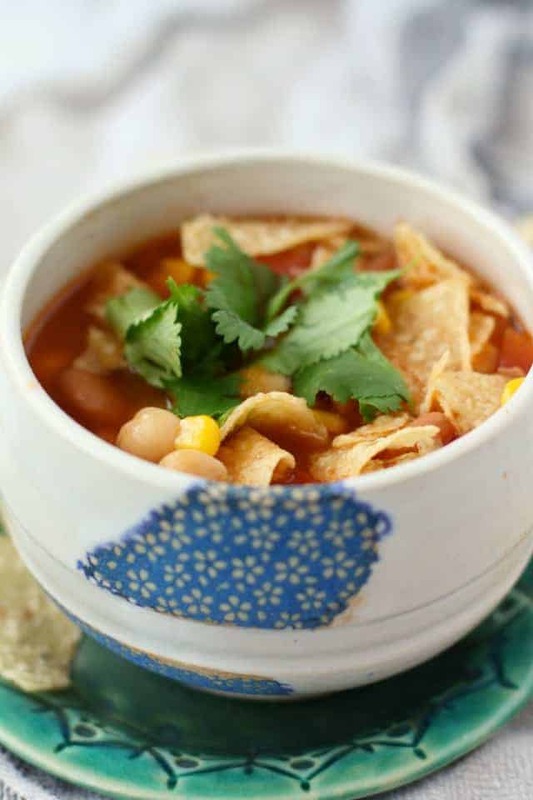 Home » Soup » Super Simple Vegan Tortilla Soup. 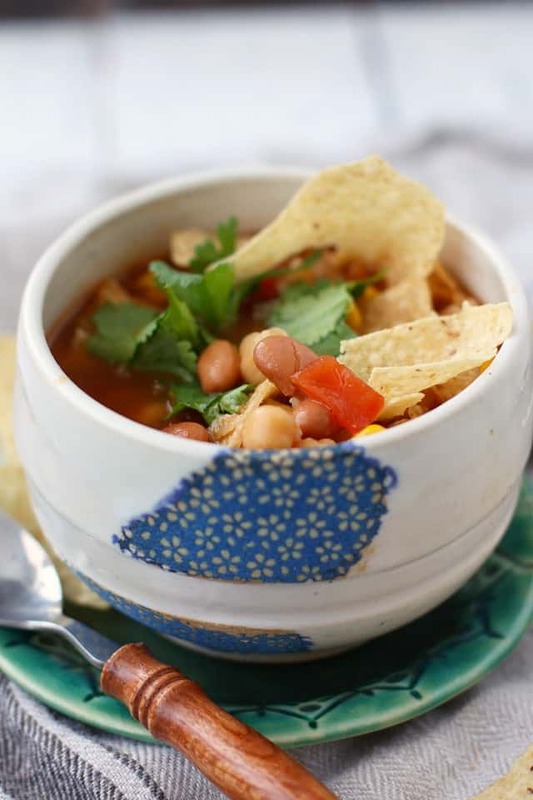 An easy recipe for vegan tortilla soup that the whole family will love. Hearty beans in a flavorful broth make this vegan and gluten free soup perfect for lunch or dinner! You probably have all the ingredients for this hearty soup in your pantry right now. Sometimes you just need a super simple recipe for a hearty soup. On busy nights, it can be easy to fall back on takeout or less healthy options. But with this recipe, you can have a pot of delicious tortilla soup on the table in less than 30 minutes. This vegan tortilla soup is inexpensive, easy, and healthy. And it’s tasty and warming on a cold day. Once you get home from work, just throw everything in the pot and let it cook for a short time. You’ll be sitting down to a tasty bowl of vegan tortilla soup in no time! This recipe is free of the top 8 allergens, and it’s gluten free, too! Make sure that the tortilla chips you use are gluten free if you need to avoid gluten. 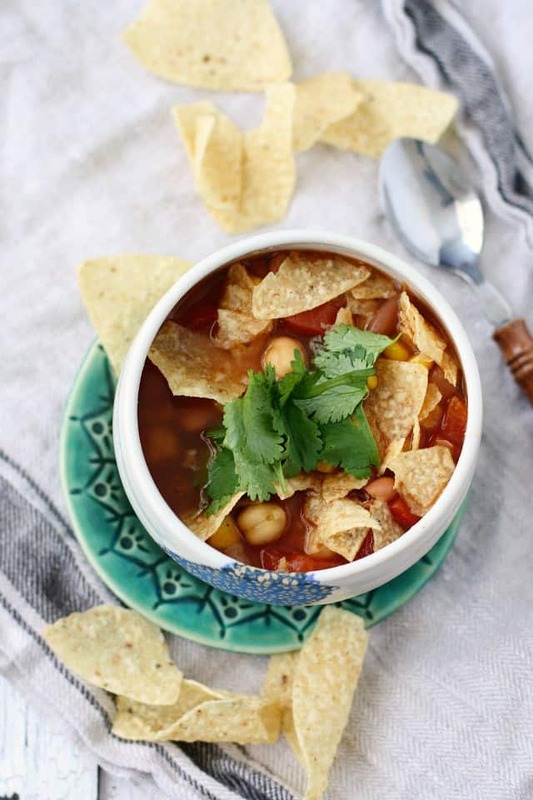 Can you make this vegan tortilla soup in the slow cooker? Yes, I think this would work well in the slow cooker. Just put everything inside and cook on low for 4-5 hours. 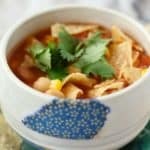 What type of beans should go into tortilla soup? I used garbanzo beans and pinto beans, but you could use black beans, kidney beans, white beans, or even some lentils. Use what you have on hand! Can this tortilla soup be frozen? Yes, if you want to freeze this soup, I recommend storing it in single-serving, freezer safe containers. This simple vegan tortilla soup is a hearty and healthy option for busy nights! Put the onion and olive oil in a soup pot and cook over medium heat for about 5 minutes, until the onion is soft. Add the pinto beans, garbanzo beans, tomatoes, salsa verde, and broth. Stir. Add the spices and frozen corn, and raise the heat to high. Bring the soup to a boil, then reduce heat to medium low, and cook for about 10 minutes to let the flavors blend. Ladle soup into bowls and top with tortilla chips and cilantro. Keep leftovers in the refrigerator for up to 5 days. Feel free to use any type of bean that you like. Nutrition facts are for soup only, not tortilla chips. Adapted from Cheap. Fast. Good! by Beverly Mills and Alicia Ross. This recipe is easily adaptable as well. If you want to add chicken, go ahead. If you want more beans, add those, too. You can customize this tortilla soup to fit your needs. I love that it’s so quick to throw together, but it’s still a healthy and filling dinner. Looking for more easy dinner recipes? Try this white bean quinoa chili recipe. This post was originally published in December 2014. It has been updated. « Deliciously Easy Dairy Free Pancake Recipe. I love bean soup, especially this time of year. Thanks for sharing! We eat beans a couple times a week, but it’s been awhile since we had a tortilla soup. Looks great! Soups like this make me so happy! Soups are meant to be easy, inexpensive, and quick to throw together! Yum!